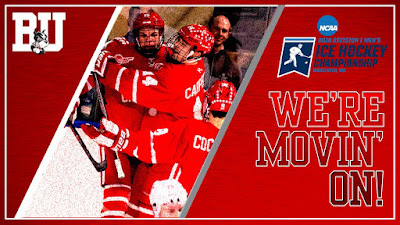 Freshman David Farrance’s third-period goal, breaking a 1-1 tie, and a 30-save performance by Jake Oettinger sent #13 BU past #4/3 Cornell and into an NCAA Regional championship game on Sunday. The 3-1 win at Worcester’s DCU Center, with goals from two other freshmen, Shane Bowers and Logan Cockerill (empty-netter), extends the Terriers’ unbeaten streak to eight games (7-0-1). 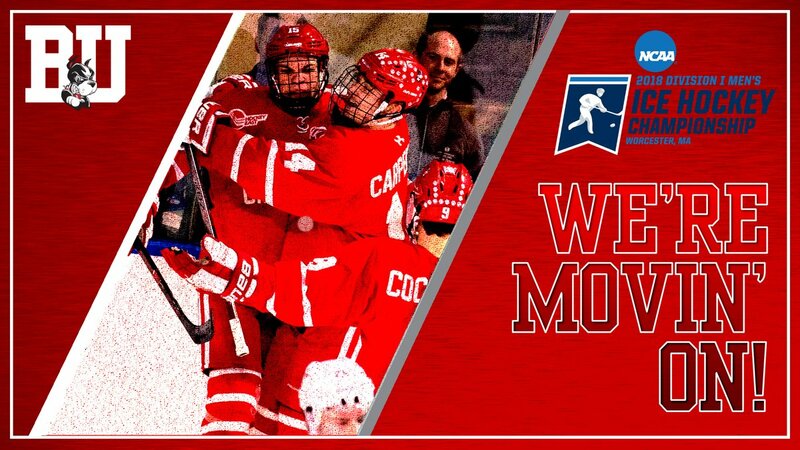 BU, the 4th seed in the Northeast Regional, will face #2 seed Michigan, a 3-2 winner over Northeastern, in the bracket championship game at 4 p.m. ET. The contest will air live on ESPN2. With Providence losing to Notre Dame in the final seconds of regulation in the Eastern Regional in Bridgeport, the Terriers are the only Hockey East team left in the tournament. Following a scoreless first period, Cornell got on the board at 7:27 of the second when Trevor Yates one-timed a Cam Donaldson pass from the top of the right circle, beating Oettinger high to the glove side. The Big Red saw its lead vanish just half a minute later. After Brandon Hickey fanned on a passing attempt, he whirled and backhanded the puck toward the Cornell goal. A perfectly positioned Bowers redirected the puck out of the air and past goalie Matthew Galajda. Bobo Carpenter picked up the secondary assist. Midway through the period the game's only two penalties were called, giving each team a power play. Cornell had two shots on its man-advantage, both turned aside by Oettinger. BU failed to convert on its three shots on goal and just missed on one golden opportunity in close. The eventual game-winner came at 4:39 of the third period when Cornell hesitated on a breakout from its own end, allowing Greenway to strip the puck and get it to Drew Melanson. He fed it to Brady Tkachuk who circled behind the cage and backhanded a pass that Farrance one-timed from the left faceoff dot. The shot went off the far side post and into the net. Late in the period, with Cornell pressing for the equalizer and BU trying to keep the puck in the Big Red's end, Tkachuk got on a forecheck in the corner and kept the puck there despite being outnumbered, bleeding precious time off the clock. When Cornell finally pulled Galajda with about just over a minute left in regulation, BU missed its first attempt to hit the empty net and Cornell resumed its 6-on-five attack. As the seconds ticked down, Carpenter collected the rebound of an Oettinger save and banked the puck into center ice. Cockerill beat a desperate Big Red defender to the puck and fired it into the empty net with 17 seconds left. LOGAN COCKERILL SEALS THE WIN! 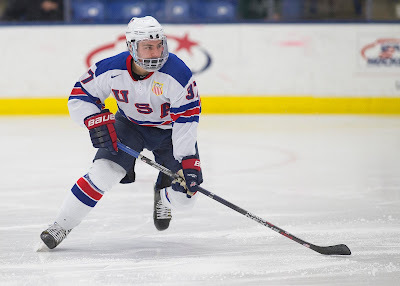 On Armed Services Night at USA Hockey Arena, 2018 recruit Jake Wise scored twice and assisted on another goal as the NTDP U18s doubled up Chicago, 8-4, and clinched a first-round USHL bye. Wise, a former Central Catholic standout, has seven goals and nine assists in the last eight games and is tied for fifth in scoring for the U18s with 36 points. Fellow recruit Joel Farabee assisted on a pair of goals including Wise’s second goal. Clayton Keller scored his 22nd goal and added an assist to extend his Coyotes’ rookie scoring mark to 59, but Arizona dropped a 4-2 decision to Florida. Danny O’Regan scored his 12th goal in Rochester’s 4-2 win against Springfield.